I slipped out the door of that little apartment I was in for the summer in Georgetown, into the dark, dingy stairwell I had helped carry furniture up when we moved in, back in June. Taking little jogging steps down the stairs in my running shorts, I descended two stories to the foyer and hoisted open the unwieldy metal door to come out upon the landing in the old courtyard of the complex. Out of the old, musty building I stepped into the almost-just-as-musty outdoors, thinking with a smile how futile was my attempt to escape the humidity of my native Houston. At times, DC was no better than a swamp. And indeed, you were occasionally reminded that it was, at one time, exactly that. Before the Forefathers made men labor day and night to fill it in, engaging in that fantasy, that hubristic charade in which humanity could play God with the awesome eternal forces of nature itself, creating solid land where at first there was only marsh – and further, erecting on that land the imposing institutional architecture that embodied that very same prideful spirit which believed it could clear forests, control the flow of rivers, and move mountains in order to impose the sheer indomitable will of the people. I run (now at a better pace) past the formidable façade of the Cathedral on Georgetown’s campus. I follow the slope of the land through Old Georgetown down to the banks of the Potomac, where I cross the Key Bridge. To my right, on the near bank, I can see the reddish-pink crushed granite of the old canal towpath heading off into Maryland. Out in the middle of the Potomac, three rocks jut prominently from the water- the Three Sisters. Legend has it that three Algonquian sisters attempted to cross the river long ago in order to save their brother, who had been kidnapped by another tribe. Halfway through their valiant but futile crossing, the sisters drowned, and were turned into the three rocks that thrust themselves defiantly out of the Potomac to this day. John Smith himself saw these rocks as he sailed up the river in 1607, and today, I casually observe them on my run. Turning my attention from the Three Sisters, I look to my left, where off in the distance I can see the spire of the Washington monument rising regally into the early evening sky. The air is heavier than usual with the humidity as I cross over the river, and it occurs to me that it might be threatening to rain, all that precipitation lying heavy up there somewhere in the sagging sky, waiting to be released. Once on the other side of the bridge, I’m in Alexandria, VA. Tracing the Virginia bank of the Potomac, I decided to take a turn onto a narrow footbridge crossing to Theodore Roosevelt Island. I had run past the bridge almost daily on my other runs, but had always ignored it. The ‘island’ looked small, and I figured it couldn’t possibly provide much room to run. But on this particular day, I thought I’d see what Teddy’s island had to offer. The trails on the island were absolutely beautiful. Soft dirt, interrupted by the occasional root, formed a corridor that wound through a tunnel of trees. A boardwalk crossed through a wetlands area on the interior of the island. As I traversed these new trails, ducking the occasional branch and covering ground with effortless speed, the skies opened up and rain fell heavy through the dense canopy above. I felt a primal sense of joy as I bounded along, discovering a new landscape with each turn of the trail. After one particularly tight turn, I startled a deer out of the brush to my right, and it bolted across my path, missing me by merely half a foot. Shaken and invigorated by my close encounter, I continued down the trail until I came upon a large clearing. The rain fell harder in the clearing, with no tree canopy to intercept the drops. 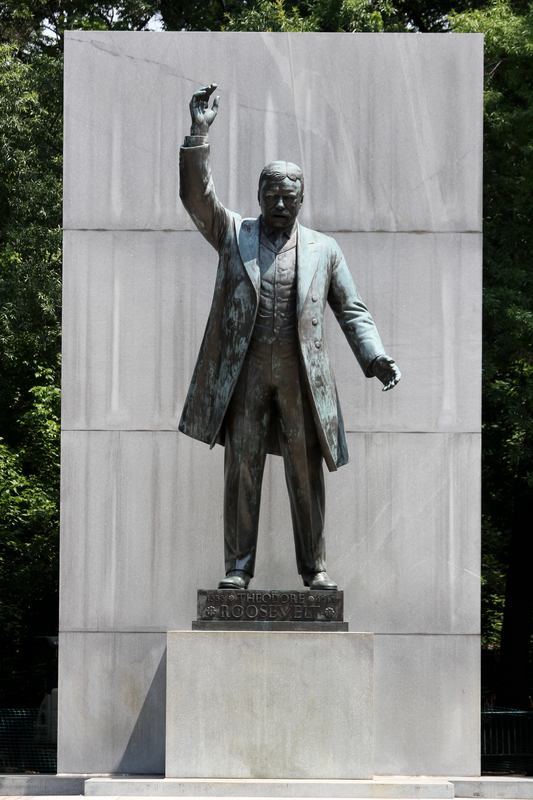 I was stopped in my tracks by the sight of a 17-foot statue of Theodore Roosevelt himself. Struck by the bizarre nature of the whole situation, I felt like I had stumbled upon an alien civilization. I was overwhelmed with a sense of irrational, uncontrollable joy- a primitive feeling of unbridled passion and energy. I ran through the rain, soaked and laughing, running circles around the clearing under Roosevelt’s discerning gaze. Not surprisingly at all, I related this quote to running almost as soon as I read it. I have a certain preconception of myself as a figure in the running world, and recent race results (read: my entire cross country season) have seemed to contradict that preconception. But the thing about racing is that you can’t just lie about your result to make it fit nicely with your view of yourself as a runner. It’s all there irrevocably in black and white, and you have to deal with it. In many ways, this is a departure from the “real world,” at least as I’ve experienced it. In running, there’s nothing for you to hide behind, no fudging the numbers, no “way of dragging circumstance about” to make yourself feel better. So the question becomes, as Steve has so often put it, “are you who you say you are?” Of course we all want the answer to this question to be a resounding “YES,” but sometimes that’s just not the case. This cross country season, it turns out that I was not quite who I said I was. I was coming off a successful outdoor season and a solid summer of training, so I started the fall season thinking of myself as some sort of badass. In the ensuing months, I was very painfully disabused of this notion. Now I’m faced with Horace’s “struggle for survival” in the running world, without the convenient and comforting option of lying to myself. But with indoor track just around the corner, redemption beckons. Although I didn’t necessarily race well during cross country, I put in a lot of good training that I fully believe will pay off on the indoor and outdoor track. Through a willful suspension of disbelief, despite overwhelming evidence to the contrary, I still see myself as a bit of a badass. And I guess this may be a subtle form of lying to myself- kind of like a ‘fake it ‘til you make it’ type of thing. Besides the fact that this quote is just obviously awesome, I believe it’s also applicable to all of us at Rogue AC. With Steve as our Virgil, we are all about to take our next step on this epic journey. So let us extinguish vile fear, leave behind us all distrust, and run some blazing times on the track- all of this bringing us one step closer to becoming who we say we are. You remember venn diagrams, right?